Mixed-severity wildfires have shaped the Klamath-Siskiyou region for millennia. Variability in burn patterns and severity creates habitat patchiness in vegetation that contributes to the high biological diversity of the region because different wildlife species are adapted to the different habitat types that result from fires. Wildfires in the region provide numerous benefits. They recycle nutrients, increase the abundance of early successional and fire-adapted broadleaf plants (fires of shorter intervals, such as every 30 years, create canopy gaps that allow persistence of these generally shade-intolerant species) and increase fine-scale, structural diversity within habitat types because many or few trees in a stand may survive a fire depending on its severity. The widespread 20th century policy of fire suppression in the region (the median area burned per wildfire decreased from 128 hectaress before Europeans arrived to 25 hectares during the fire suppression period) has resulted in major effects on landscape structure, biodiversity, and ecosystem functioning, especially in dry, low-elevation forests characterized by more frequent fire return intervals. Some research shows the region’s forested landscapes were generally more open due to fire prior to the 20th century than they are today and today’s landscape is characterized by denser forests, less structural diversity, more fire-sensitive species, fewer coarse-grained vegetation mosaics, and a greater likelihood of high-severity fire (particularly in previously open ponderosa pine forests). Douglas-fir, and white fir to a lesser extent, increased the most under fire suppression and both are more sensitive to wildfire when young than pines. Other research shows fires in the region have increased in size in recent decades but have maintained fire-severity proportions in line with contemporary and historic fires: 59% low-severity, 29% moderate, and 12% high-severity. Many fires that do show high-severity effects are related to infrequent, severe drought, but fire exclusion practices have had minimal impact on these fires. Topography: a primary control on fire behavior (evidenced by consistent relationships between fire boundaries and topographic features in complex terrain); likelihood of high-severity fire on ridgetops and upper topographic positions (due to preheating of fuels, higher winds, and lower canopy cover). Weather: can override topography and be a main driver of fire behavior. Impediments to Fire Spread: streams, riparian zones (canopy and soil damage lower in riparian areas compared to uplands in Biscuit Fire), sharp changes in aspect, changes in vegetation. Vegetation: drier vegetation, especially untreated post-logging slash and debris, is more likely to ignite and stressed and dying vegetation allows more and bigger fires. Shrub cover: there was a positive relationship between shrub cover and canopy damage in the Biscuit Fire. Mature and Old Forests: the long absence of fire (>75 years) results in lower likelihood of high-severity fire (due to decreased abundance of combustible understory fuels from shading [e.g., shrubs, evergreen hardwoods] and increased height-to-crown with forest age, due to lower understory temperatures from shading. Plantations: tend to experience higher-severity fires, more combustible than co-occurring forests, experienced twice as much severe fire as multi aged-forests. Closed forests: lower fire severity in forests where fire had been absent for 57 years (compared to forests that had experienced more recent fire) much lower severity fire than open forest and shrubby non-forest habitats. Serpentine: low-productivity, high shrub cover sites with few trees experienced among the highest rates of conifer crown damage in the Biscuit Fire. Mountain Pine Beetles: outbreaks do little if anything to increase fire severity. North-facing slopes: longer times between fires (because wetter conditions inhibit fire) but can be high-severity fire when fire occurs (because of high tree densities). South-facing slopes: more frequent fires (because drier conditions), likelihood of high-severity burn on upper third of slope and ridgetops. West-facing slopes: longer times between fires (may be due to low productivity soils), likelihood of high-severity burn on upper third of slope and ridgetops. Southwesterly slopes: likelihood of high-severity fire (because drier conditions), especially in upper topographic positions. East-facing slopes: more frequent fires. Douglas fir, once mature, is extremely fire-resistant thanks to its thick bark, deep roots, and high crowns. Similarly, mature ponderosa, Jeffrey, and sugar pine are also fire-resistant. In contrast, most trees of the much rarer sub-alpine zone have thinner bark and are easily damaged or killed by fire. These include mountain hemlock, Shasta red fir, white bark pine, western white pine, fox-tail pine, lodgepole pine, and curl-leaf mountain mahogany. A consistent finding from the Biscuit Fire, and other nearby fires, was the high resilience of plant and animal community composition in the aftermath of fire, even in areas burned twice within 15 years. Both conifer- and hardwood-dominated riparian plant communities returned in similar states following the Biscuit Fire due to abundant regeneration. Following a repeat high-severity burn, bird community richness remained level or increased and bird densities increased. Small mammal richness and community structure was similar between twice-burned and once-burned areas, but densities were higher in twice-burned areas. Lastly, plant species richness actually increased after a repeat burn due to increases in ephemeral fire-adapted plants in combination with minimal species lost. habitat. In locations where the mixed-severity Biscuit Fire re-burned over the 15-year-old Silver Fire, low-severity patches tended to burn at low-severity and high-severity patches tended to re-burn at high-severity. High-severity fire has played a role, at least in some areas, in shaping the structure of the region according to the presence of large (more than100 hectares), even-aged patches of trees in the Klamath Mountains and southern Cascades. 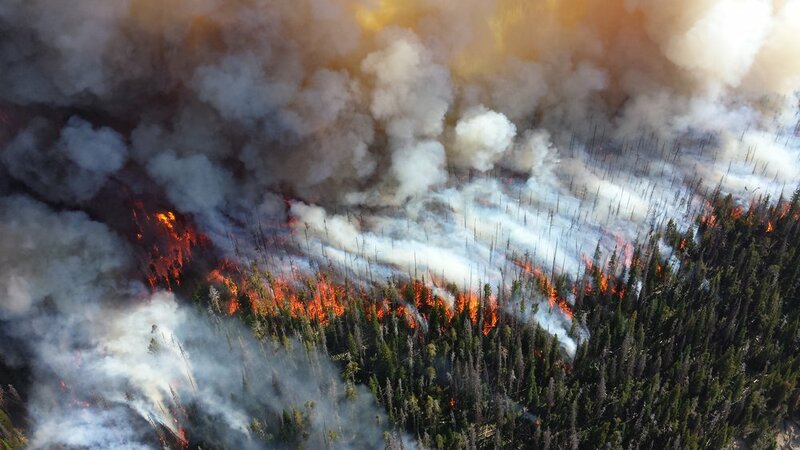 The recurrence of fires in western forests varies widely, from once per decade in a few dry pine forests to cycles of 250–400 years (or more) in coastal forests. Many birds depend on disturbances such as fire. In general, the following types of birds increase in abundance following a wildfire: cavity-nesting birds, aerial insectivores, and ground-and shrub-nesting birds. Early hardwood cover following a fire can be moderate-to-high and this provides good habitat for open-cup nesting birds while aiding soil function and mycorrhizal networks. The black-backed woodpecker depends heavily on burned forests and their populations often increase dramatically following a fire. After high-severity fire, abundant birds were those associated with dead wood (hairy woodpecker), bare ground (dark-eyed junco), and aerial foraging (Townsend’s solitaire). The presence of shrubs helped predict both avian abundance and composition, and presence of snags helped predict bird community composition. It appears once-burned areas and twice-burned areas may converge in bird community composition over time. Recent burn (2–3 years post-burn): hairy wood-pecker, Townsend solitaire, dark-eyed junco. Repeat burn (2–3 years post-burn): lazuli bunting, rufous hummingbird, spotted towhee, fox sparrow, white-crowned sparrow, nashville warbler. Old burn (17–18 years post-burn): wrentit, orange-crowned warbler, black-headed grosbeak, Macgillivray’s warbler. Learn more about Fire in a changing KS in our benchmark Climate Report.